The fact is, insurance is misunderstood. Even savvy business people are often unaware of the layers involved in our industry—producer, underwriter, carrier, P&C, personal lines. To them, we’re just one term—an insurance person. So, when someone else’s reference for our industry is the Geiko gecko, your chance of getting sound job advice from them is slim. Yet everyone needs a sounding board; someone to bounce off ideas, worries, new products or techniques. Look no further than PRO-to-PRO, an interactive, thought-provoking conference that will send you home with practical, actionable ideas. PRO-to-PRO, as in professional-to-professional. This is where you’ll find your “Been There; Done That” peers who understand what you do. We’re not talking theory. We’re talking solutions to your day-to-day trials and tribulations. With discussions led by experts, and fueled by people who work at agencies and organizations just like yours. Imagine the insight. Imagine the frank discussions. Imagine what you’ll miss if you don’t attend! This is PRO-to-PRO’s 28th year, so you know we have to be doing something right. 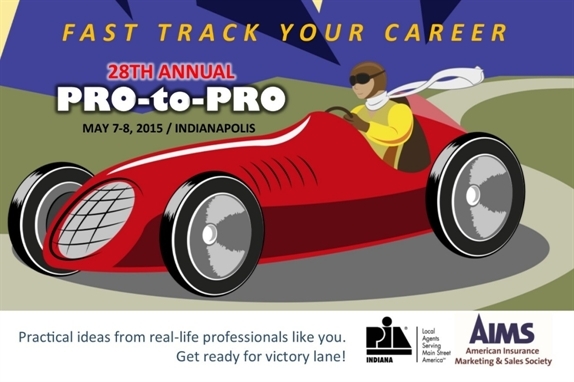 This year, we’ll be in Indianapolis from May 7-8. If you haven’t been to Indy, I think you’ll be impressed. Of course, you know about the race track. Did you also know it’s the 14th largest city in the United States? And it will be all spring green and flowery that time of year too. If you’ve been to a PRO-to-PRO before, I hope you’ll sign up for a return visit. If you’ve never been, please make this your year. There’s nothing better than talking with a room full of people who already get where you’re coming from. To learn more about the agenda—things like social media or productive renewal strategies—you can visit AIMSSociety.org. If you have any questions at all, please call us at 877-674-CPIA (2742). Ready to register? Just pick the PRO-to-PRO heading on the right side of the home page or go directly to this link: http://www.aimssociety.org/events/event_details.asp?id=600327#. Does your agency have the ability to digitally market to customers and prospects using a series of emails? If not, you need to find a provider that offers a system that lets you do so—that lets you reach out frequently with directed messages. Digital marketing has been around for years; not including it in your agency’s marketing strategy is a major mistake. Some people argue that there is too much noise in email or that we’re constantly bombarded with emails. That might be true. But the way to break through that noise and to get the reader’s attention is content. And that content starts with the subject line. 1. Absolutely no trickery. Ever. Your subject line should tell the reader what to expect in the email. When read, the two should align. If you are lucky enough to have someone open an email with a deceptive subject line, expect the reader to unsubscribe. And who loses when that happens? Your agency does. 3. Numbers work. If you notice, many blogs and marketing emails use numbers in the headline or title or subject. People want to know “Seven simple ways to…. “ whatever. It’s proven that such subject lines boost open rates. So remember, numbers work! 4. Choose your words carefully. Some words just don't work. For example, the word “reminder” in a header or subject line often lands the email in the spam folder. Why? Spammers use “reminder” in their emails, and you don’t want to sound like a spammer. Another word (okay, words) you should avoid: “percent off.” Again, this is a popular spam subject; don’t use it. To see what other words that might keep your email from being seen, Google (in quotes) “common spam words” and check out one or two of the lists that appear in the search results. 5. Think like Goldilocks. Subject lines should not be too long or too short. The ideal length should be 50 or so characters, give or take a few. It’s important to remember that some email programs cut characters off. So be careful to not put important words near the end. 6. Tell stories. Approaching your subject line as a story could engage your reader’s curiosity. Good emails—like good stories—evoke emotions like anger, joy, gain, curiosity, humor, fear and so on. Telling stories connects. Doing so also let readers put themselves in the situation. 7. Before you click “send,” make sure your subject line is tested. That goes back to our fourth point. Most digital marketing systems have a feature that lets you test to make sure you’ve not accidentally included any words that will send your email to the spam folder. AIMS Society Board member Chris Paradiso, CPIA, is owner and president of Paradiso Financial & Insurance Services in Stafford Springs, Conn. He recently wrote an article for the AIMS Society members-only Quik Sales Tip newsletter that explained how to boost digital marketing open rates. To learn more about AIMS Society membership, click here. The whole notion of blogging can, for some people, seem daunting. But it doesn't need to be. Blogging is simply sharing thoughts and other information in writing-something you've probably been doing in newsletters or e-mails for years. A key difference between blogs and what you've been doing all along is the platform or delivery method used to share the info. Blogs are online (the term, "blog," is short for Web Log) and they're often created using a blog editor on Word Press or a similar platform. 2. Back up your blog. No matter how careful you are, a blog can get mistakenly deleted in a flash. I can’t stress enough how important it is to back up your site. Most hosting services will have a back-up feature in place; know how it works and make sure it’s functional. 3. Pay attention—and respond—to comments. One of the most valuable features of blogging is the ability connect with people. If you fail to respond to comments left by readers, you don’t connect. Don’t ignore what your audience says. Responding to comments not only increases your connection with others, but when casual visitors see you interact, they’re more apt to subscribe. Plus, more comments and more activity boost your search engine ranking. 4. Filter responses. Legitimate comments are great. SPAM comments? Not so much. Install an automatic SPAM filter on your blog to keep unwanted comments away. Askimet.com is a free Word Press plugin that filters out spam and lets well-intentioned comments appear. Unfortunately, the more popular your blog becomes, the more SPAM you’ll receive, so it’s important to filter out the bad stuff as quickly as possible. 5. Leverage your blogs on social platforms. A great part of blogging is connecting with others. Set up accounts on Facebook, Vine, Instagram, Twitter, Google+, Pinterest and LinkedIn—among others—to build your social following and boost traffic to your blog. Plugins are available that will integrate your social profiles with your blog. 6. Start learning about HTML. Get at least a basic understanding of hypertext markup language—the main language for creating web pages. This is important because, as we know, Google makes the rules around search results, and its algorithms that drive search placement read and take into account HTML. Proper use of the language, which web browsers actually use to interpret and compose text, helps Google and other search engines find your business online. I often compare it to a fingerprint; it’s identifies you and your business, and nobody else’s. Prepare yourself to spend some time learning and using HTML; it will make your life a whole lot easier! 7. Keep an open mind and never stop learning. If you feel you know it all or that you’ve "arrived,” your blog will become stale and start losing followers and traffic. Stay interested and keep learning about successful blogging—in web articles, YouTube videos, social networks, discussion forums and more. Your skills will improve and your confidence—and success—will grow. AIMS Society Board member Chris Paradiso, CPIA, is owner and president of Paradiso Financial & Insurance Services in Stafford Springs, Conn. If you’re an insurance agency owner like me who writes a large portion of business in the commercial lines area, then you should be looking at LinkedIn regularly. It can be extremely beneficial when trying to find prospects in the business world. Because of this, you should have a very strategic way in which you present yourself and your insurance agency online through LinkedIn and other social platforms. 1) Let your customers and prospects see your true business side. What does this mean? As you’ve probably heard, we only have six seconds to make a first impression. Let's take full advantage of the photo we put in our profile. The photo should be professional and clean, so that it portrays your image well. If you choose not to portray yourself in the photo, then your agency logo will work well also. 2) When connecting with people on LinkedIn, it's very important to personalize each LinkedIn request. By choosing a generic message, you’re simply saying that it’s really not too important if they choose to accept your connection invitation. Don't send the wrong message to the person with whom you’re trying to create a relationship. 3) Fill your profile with relevant and pertinent information about you. Make sure it’s easy to read and lets people to understand exactly what you do for business. Stay away from repetitive and irrelevant information, because that could only slow down the reader and, perhaps, cause them to pass you by. 4) When asking for endorsements, be sure to ask those who know and understand your work. This is very important, since we all need to get endorsements from our connections that show who we are and what our work etiquette is. We should avoid sending out a message to everyone asking for endorsements. This is especially true for those of us who have a lot of prospects built in to our LinkedIn connections. Asking prospects—who are not actual clients—for endorsements could irritate them and turn them off to you and your business. It’s also to remember that "endorsements” on LinkedIn is a two-way street. When you endorse people, it lets them know you appreciate and admire their work. Make sure you really do appreciate and admire it, and don’t just endorse everyone in your network. 5) Always treat your recommendations like a reference. Why? Because if someone you’re connected with has a poor reputation, then that could reflect poorly on you. We really need to do our homework before just accepting every recommendation. Remember, in the social media world, LinkedIn is B2B: business-to-business. Don’t use LinkedIn like you use Facebook, because Facebook is a B2C (business-to-consumer) platform. Be aware of your posts and your connections and remember, you only have six seconds to make a good first impression. Let’s face it; a customer’s experience is everything. I say that because many insurance professionals believe that people do business with their agencies because we provide great service. My belief on great service stems from the idea that we receive a significant commission by providing great service, so I feel that every single one of my clients should expect to receive outstanding service from my agency and myself. I believe there are three major points in a customer’s experience. It doesn’t really matter if I think that I have provided great service or my staff has provided great service. All that matters is the service that my client experienced with our office. You Can Hear Us Smiling! First and foremost, this stellar customer service experience begins with how we answer the phone. As we all know, the first impression is everything. I coach and remind my staff all the time that we need to answer the phone in a positive manner, because it can have a lasting positive effect on our prospect or client’s rest of the day. This is perhaps one of the most important and simple ideas that your agency can practice because there are so many agencies out there that answer the phone as though it’s an inconvenience. 2) no one can truly understand what a customer may be going through when they’re reaching out to our office. The second point of our discussion relates to our set of expectations in handling a new prospect or client. If a customer calls for an insurance quote, we set a timeline expectation for when they should hear back from our office. I personally feel this is extremely important because people need to know in today’s fast paced world when to hear back from our agency. This is so important because I place myself in the same situation as a specific prospect that may be calling for insurance quote, and I personally would like to know when I can expect a phone call back. As an agency owner, I realize that things occur during the day and sometimes we cannot meet the expectations of what we have originally set, but it’s critical to inform a client that if we say we’ll return your call at 3 o’clock, we will actually call them back at 3 o’clock, even if we do not have their quotes finalized. If this occurs, pick up the phone to reach out to the client and apologize for not being able to complete the quote but explain that you’re reaching out to keep in touch. It’s all about the communication with the client or prospect. The third point is the follow-through. Following through with what we have promised and/or have set as expectations is critical. For example, if we have recently quoted a piece of business and the client has suggested that we contact them within two days so that they could have time to review the quote with their spouse, we as an agency need to follow through with the expectations that our clients have set forth. Without the follow-through, you will simply become a professional estimator, and remember professional estimators are not paid very well. As I write this article, I think of a great friend of mine who is an agency owner in New Jersey named Nick San Filippo, who always reminds me of the importance of how the customer perceives your service to be. Remember, it’s not about us, it’s all about the customer and their experience. Chris Paradiso is the newest member of the AIMS Society board of directors. See more from Chris at Paradiso Presents, LLC.